In the mind's eye, social housing does not have soft edges — at least not aesthetically. The term conjures up images of Brutalism, stern geometry and — excepting the occasional washed-out shade of local authority turquoise — a reserved visage. 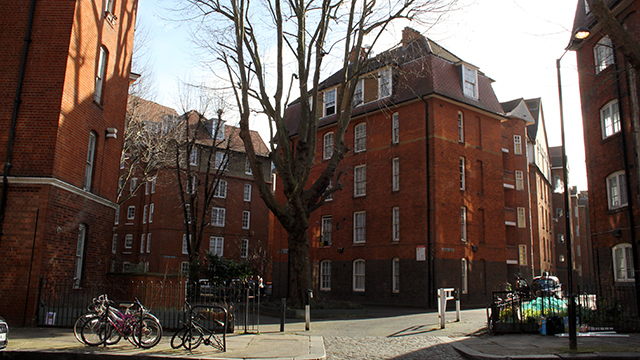 But the Boundary Estate, which has stood since 1890, defies this stereotype. It’s arguably the world’s oldest council estate, but it also has a claim to being one of the most architecturally unique. 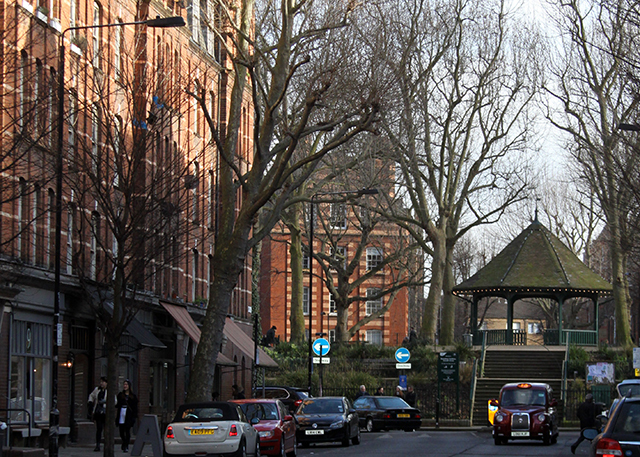 Its Grade II listed buildings are modest, but have dignified curves and embellishments; the estate spirals outwards from Arnold Circus — a splendid community fulcrum with gardens and a bandstand. The shapes which radiate from that roundabout are receptive and airy, rather than imposing. 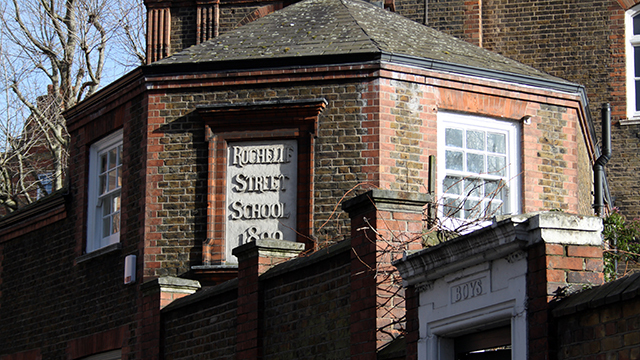 Rubber-stamped in 1890 by the then new (and now defunct) London County Council, the estate trialled a new form of philanthropy. Officials opted to flatten the Old Nichol slum — a notorious no-go zone whose fearsome reputation was promulgated in novels like A Child of the Jago. 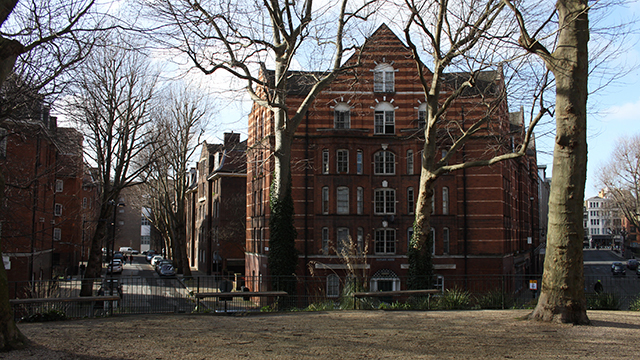 In its place went up beautiful red-brick, Arts and Crafts-influenced homes for those they felt "deserved" them. Judging who deserved a tenement in the new builds, and who should be banished to some other slum, was deemed by some to be a cruel and arbitrary process. But the Victorians were capable of blurring poverty and immorality even more than our own tabloid era of "benefits cheats" and "sink estates". 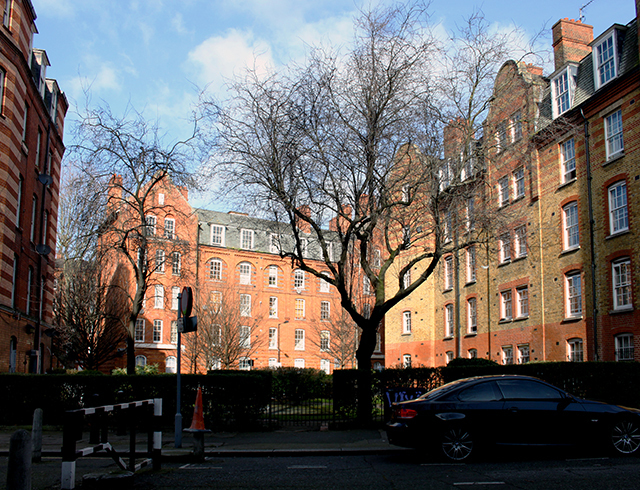 Gentrification of the area has seen privately-owned flats within the estate become increasingly sought-after. But around two-thirds of the 500-odd premises remain under the control of Tower Hamlets Borough Council, and a unionised residents’ group is determined they remain so. 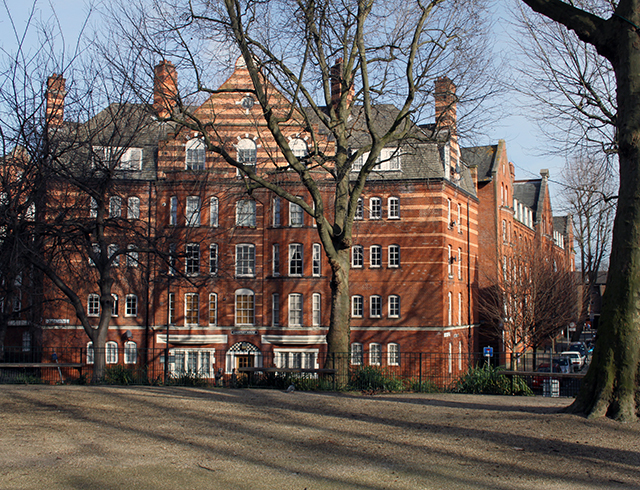 In 2006, they rallied against a move to hand over the estate to a housing association. Although there's not much traffic, the Circus is a bustling social cauldron. But it’s also a destination in its own right, easily explored from the northern extents of Brick Lane and Shoreditch High Street. On the Sunday we visit, tenants clutching plants from the nearby Columbia Flower Market cross paths in the Circus with pushchair parents and Hoxton’s coffee nerds who filter into the artisanal outlets occupying the old Victorian workshops. Historical photographs kindly provided by the London Metropolitan Archives. You can see over 130,000 historical images of the capital — from the 16th century onwards — via its Collage website. The campaign to raze the Old Nichol Rookery slum was spearheaded by Rev Osborne Jay. 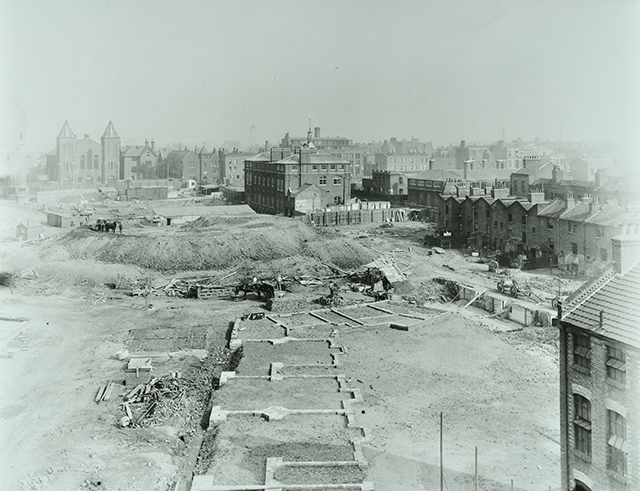 Looking south east in 1895, all that remained of the former slum was St Philip's Church. Jews, and later the Bengali community, brought greater diversity to an area which was already a cultural melting pot. Image from London Metropolitan Archives, City of London. The estate is nearing completion by 1903, with only the bandstand still to be added. A 2009 Museum of London excavation (PDF) proved that the central mound was raised from the rubble and left-behind items of the former slums. Image from London Metropolitan Archives, City of London. 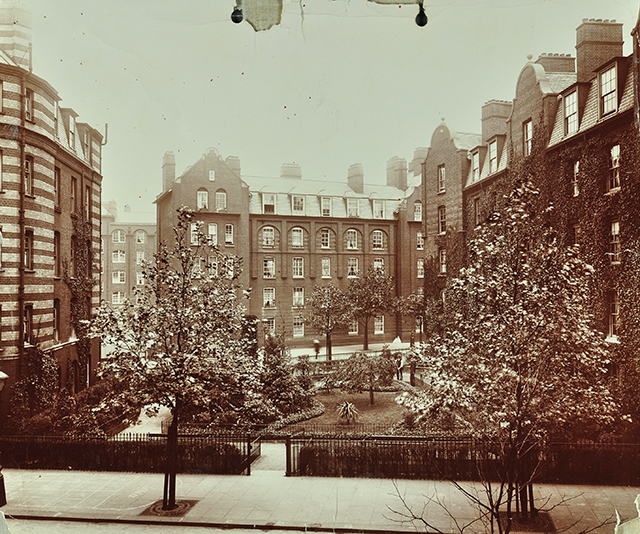 The new tenements housed some 6,000 residents at their peak, which exceeded the number displaced by the construction. Tellingly though, it's said that only 11 of the former slum-dwellers could afford the new rents. 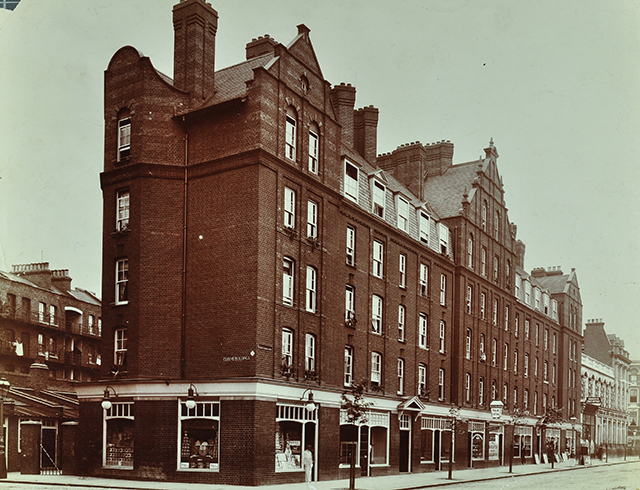 Chertsey House in 1897, from London Metropolitan Archives, City of London. Looking west towards Shoreditch at the junction of Boundary Street and Calvert Avenue in 1901. 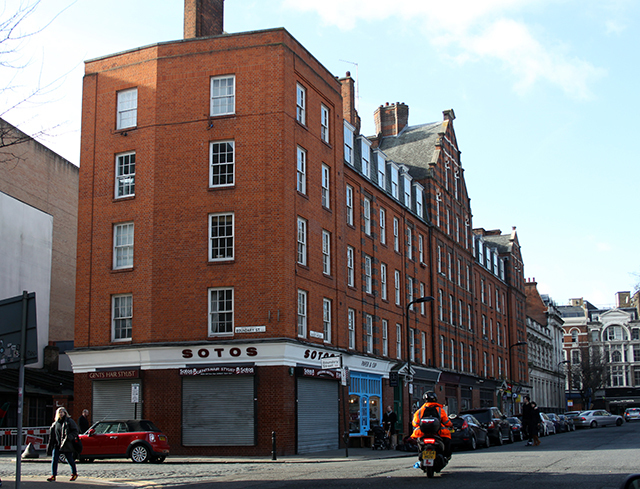 As the name implies, Boundary Street had been frontier territory - a line some Victorians would fear to cross, with others downplaying the depravity of the old rookery. Image from London Metropolitan Archives, City of London. 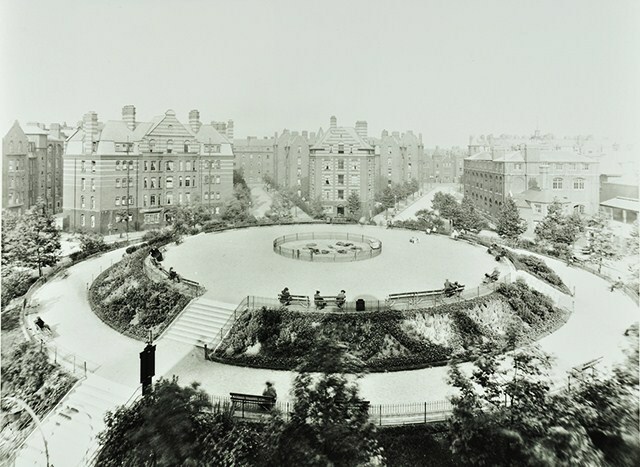 The estate's provision of green open space was considered radical in a city with longstanding spatial challenges consequent on the Industrial Revolution. 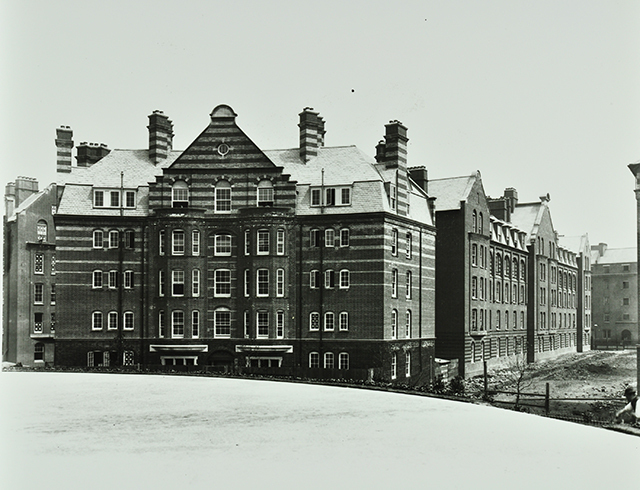 Looking north from Rochelle Street to Culham House in 1907. Image from London Metropolitan Archives, City of London.